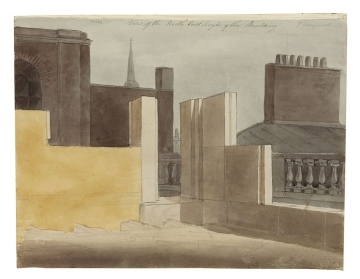 Drawing 12 is a perspective showing the north-east angle of the upper office, with part of the bank, the spire of a church and the balustrade bordering the Garden Court. The brick wall of the north wall adjoins the stone wall of the corner and east wall, leaving a narrow gap that would eventually hold door. The far right-hand space shows where a semicircular-arch window would be added. 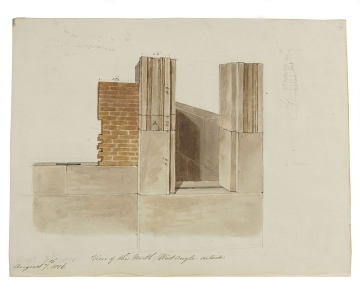 Drawing 13 shows the exterior north wall and part of the inside of the west wall (through the window gap). The window jambs have sinkings (incised or tooled lines), sitting on a high plain base. Though the exterior would not have been visible from the street, it faced on to a high section of the bank that would have had a direct view of the new upper office.